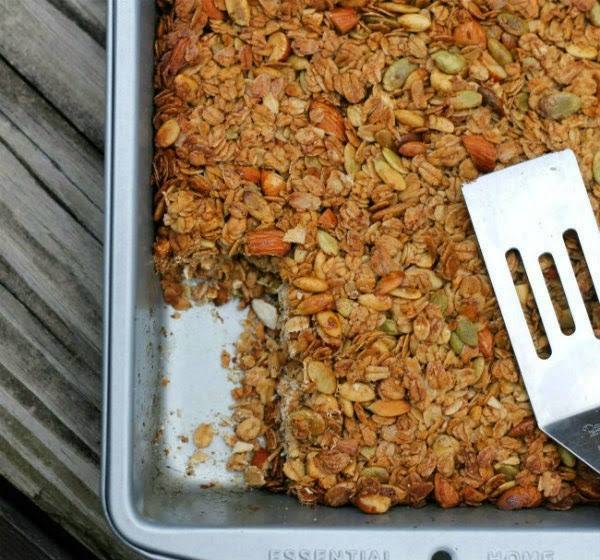 Fall Spice Granola, warm spices of fall make this a tasty granola. I think I have been a little obsessed with a couple of things this fall. For one thing I have been making homemade granola… a lot more than I ever have in the past. I am not sure why… I have always loved it, but for some reason this fall I find myself in the kitchen making the stuff. Yes, and then there are the fall spices, or at least what I think of fall spices. You know cinnamon, ginger, and nutmeg. I just can’t seem to get enough of them right now. It not that these spices are new to me or anything, but in the past I used them usually with only pumpkin desserts, especially the ginger and nutmeg. For some reason when I decided to make granola again I got it stuck in my head that I really want to add a little ginger and nutmeg to the whole mix. You know what? It worked! 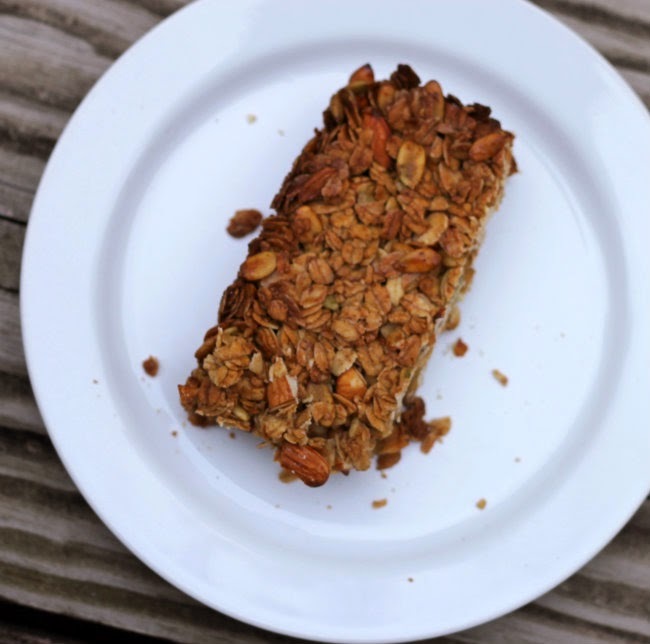 I wanted to cut these into bars, which I did, but they are a bit crumbly… so I am not sure if they should be called granola bars or just plain granola. But then my daughter said that she thinks that homemade granola bars are somewhat normally crumbly. 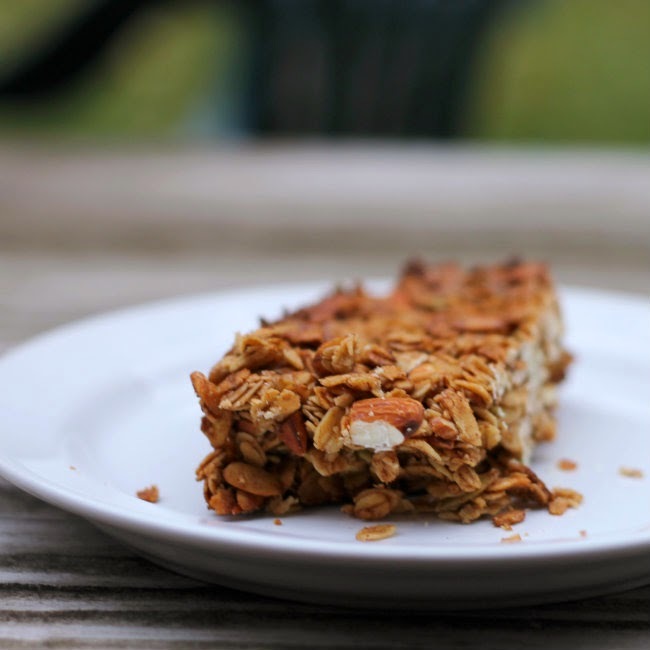 So not matter if you call this stuff granola or granola bars, one thing for sure you can call it yummy. In a small saucepan add the honey, butter, and brown sugar heat over medium heat, stirring occasionally. Continue to cook until the mixture comes to a boil and remove from the heat and stir in the vanilla. While the butter mixture is cooking in a mix the oats, pepitas, cashews, almonds, cinnamon, ginger, and nutmeg. Once the butter mixture has come to a boil and you have removed from the heat pour it over the oat mixture and stir until well blended. Butter an 8 by 8 baking dish. 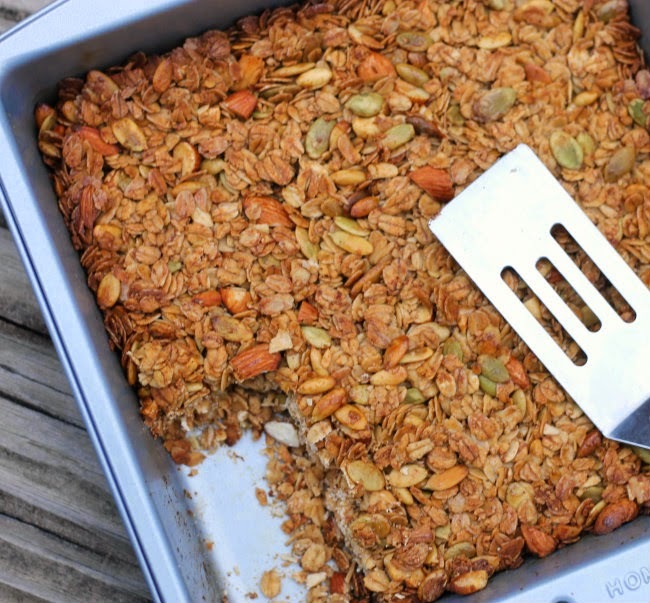 Pour the granola mixture into the prepared baking dish and pat firmly into the dish. Place in the preheated oven and bake for about 25 minutes or until lightly brown.Remove from the oven and cool completely before cutting into bars. Remove from the oven and cool completely before cutting into bars. I love fall spices in anything and everything. It’s part of the fun of the season, not just eating them but smelling them as they bake. I love all of the fall spices in these! And that you left them as big chunks, which is how I prefer my granola.